The famous escaped slave and abolitionist is shown in a stately pose. Sepia-toned likenesses of young Frederick, learning to read and later practicing his gift of great oratory, provide a backdrop. Frederick Douglass was an escaped slave and an influential force for the abolition of slavery. His speaking skills were so moving that he was encouraged to write an autobiography of his life under slavery. The Narrative of the Life of Frederick Douglass was the first of his three impactful autobiographies. The exposure created by his work put him in danger of being recaptured and so he chose to flee to Ireland and Britain where slavery had already been abolished. He later returned to America and started the abolitionist newspaper the North Star. Considered by many to be the most influential African American of the 19th century, Douglass pushed for a variety of reforms including: women's rights, land reform, free public education, and peace. He fervently believed in and promoted agitation as a requirement for social change. 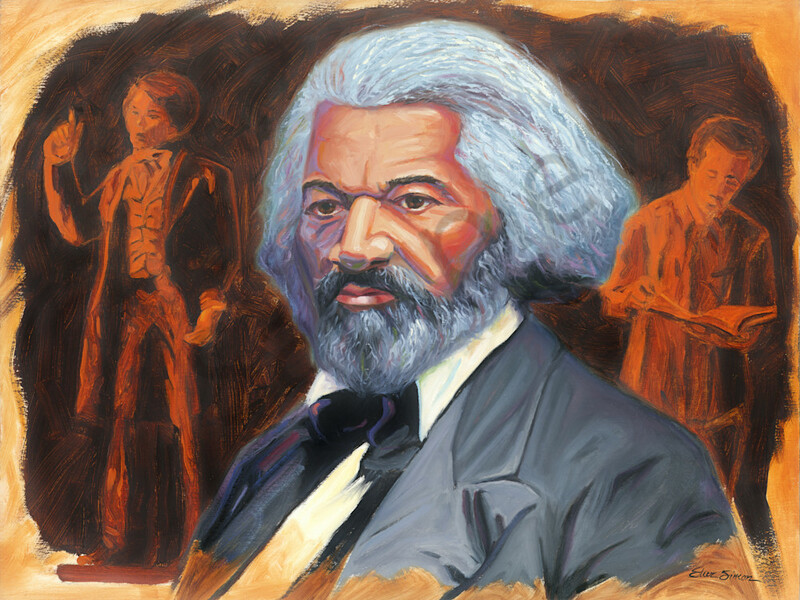 Oil painting portrait of Frederick Douglass, the escaped slave and famous abolitionist.